Jessie Hernandez has attended several Memory Days at the Laindon Library this year and brought some of her favourite photographs along with her. One of them was this lovely picture of her mother (also called Jessie) taken in her Civil Defence uniform during the last war. 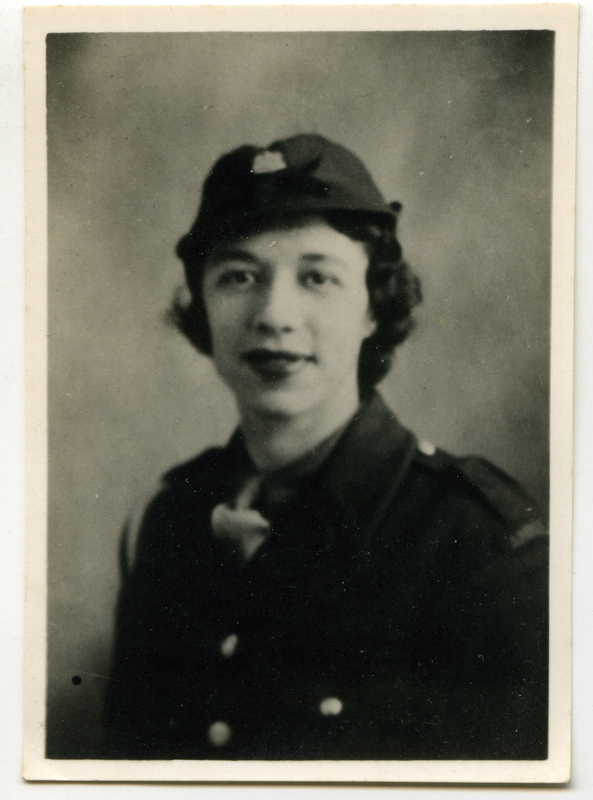 Jessie was told that while a member of the Civil Defence, her mother was an ambulance driver. Uncertain as to where the Civil Defence was based, it may possibly have been at the former Dunton Colony where from 1941 to 1942 the camp was taken over by the Civil Defence, then prepared and equipped as a Hospital for local air raid and war casualties. 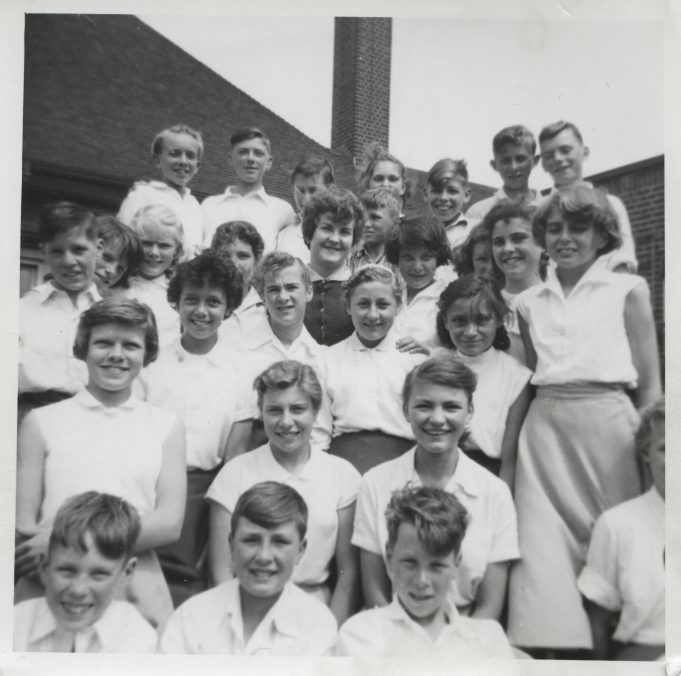 Jessie, who was born in 1945, has always lived locally and went to Langdon Hills Primary School and Laindon High Road Secondary School. 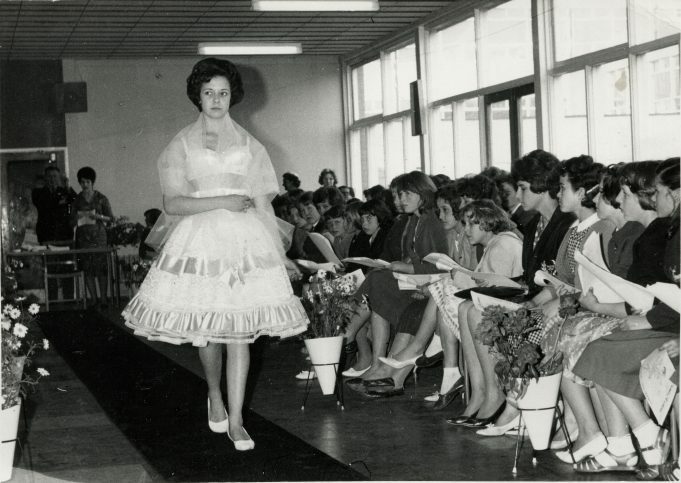 While at Laindon High Road School Jessie took part in a fashion show organised by Dorothy Perkins as part the 1961 ‘Commonwealth Technical Training Week Career’s Exhibition’. The show took place on 29th and 30th May at Woodlands School and was repeated at Laindon High Road School. 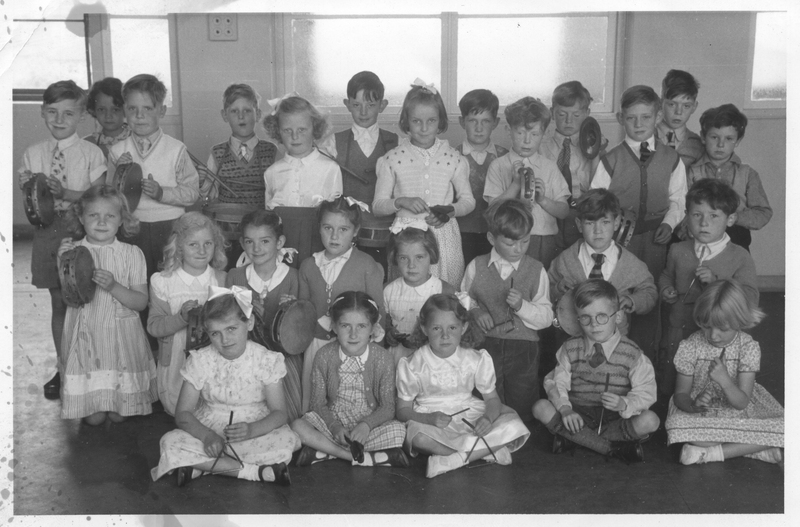 Jessie belonged to the Girl Guides and took part in various other local activities including a pantomime or two. She enjoyed spending time with friends at the popular meeting place ‘Enefer’s Café’ at the Fortune of War roundabout. 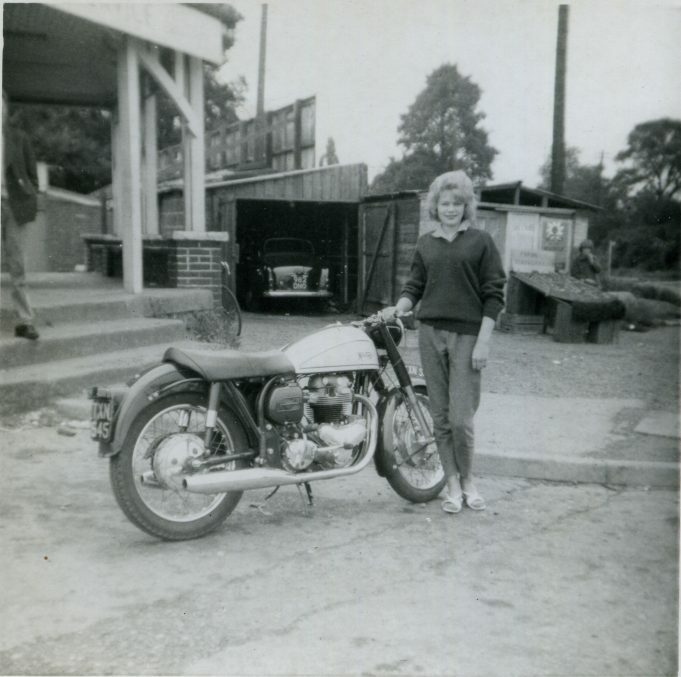 The photo below shows June with a very fine motorbike, registration number TXN 545. Anyone know who it belonged to? Interesting to notice the stall of strawberries for sale at the right of the picture. 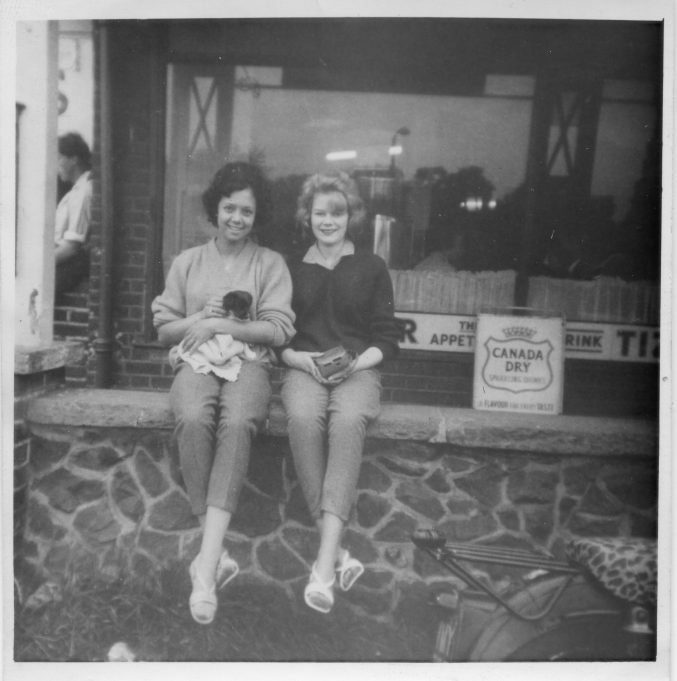 Many thanks to Jessie for sharing her photographs and we hope to see her at the Laindon Library on many more Memory Days in the future. Jessie's mum also called Jessie. Jessie at Langdon Hills Primary School. Jessie at Laindon High Road Secondary School. Fabulous photographs from back in the day, around the Fortune of War area. Good to see that nothing more potent than Tizer and Canada Dry were being sold in Enefers Café, quite different from the pub across the road. 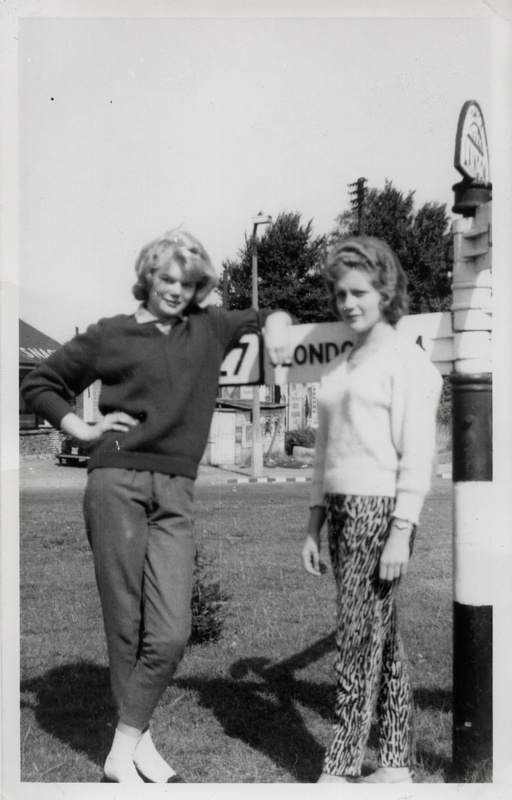 Doesn’t Susan Galsworthy look stunning in that pale top and animal print trousers, I would love to know what year this was, 1961 is mentioned and the fashions drop right in to that era, Nina will know. A Laindon gone now but the memories are still clear. We used to cut through this area to Kings Road and Queens Road where one of our school friends, Mary Baker lived, just to play records after school – brilliant times . Nowadays the roundabout is cut in half and blocked. Enefers is now a McDonalds and not a particularly good one. Susan was in the same class as me 1957-1960. She chose not to undertake the extended course. I agree with Richard, around 1961, give or take a tad. These lovely photos of Jessie and also of June Smith bring back some great memories of school days. I remember Jessie from Langdon Hills Junior School as well, she was always so pretty and I think was the youngest in our class. I’m hoping to meet up with her at the meeting in March. I went back to Laindon a couple of weeks ago, to visit my brother Dave, who still lives in Victoria Road, and drove past what was the old school in the High Road, I know things have to move on, but what a shame to have pulled the old building down. Still it can’t wipe out our memories. What lovely girls these three were, I remember them all especially Susan who went out with my mate Stefan Labezki for quite a long while. The motor bike in the photo belonged to Malcolm Paine, he always kept it immaculate, it was painted red and white, a 58/59 Norton Dominator “88” 500cc from memory. Good to see these very nice photos, thanks Nina and my best wishes to the three young ladies, I bet they’ve hardly changed from then. How refreshing to see the fashions and hair styles of yesteryear, when the girls looked like girly girls. 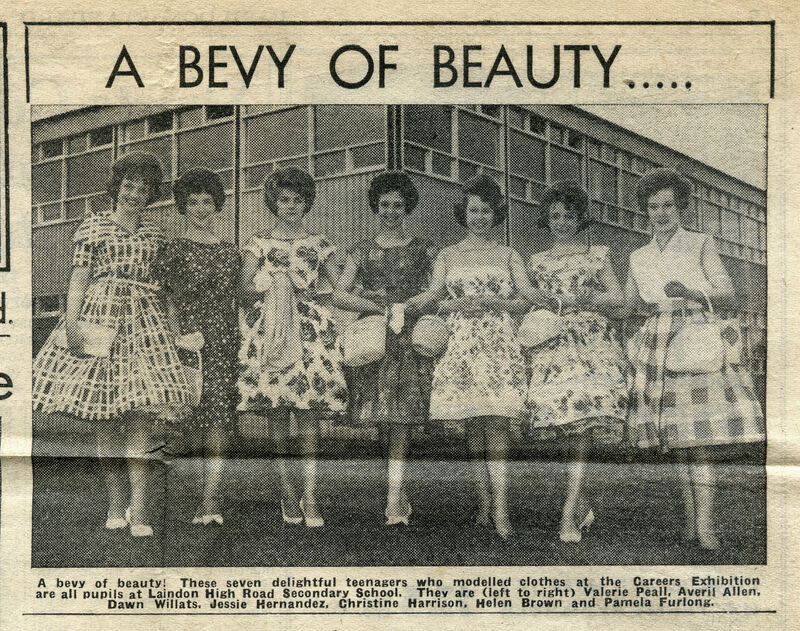 Unlike some of the more modern trends. Great photos Jessie. Lots of lovely memories for you. Lovely photos Jessie – so many familiar faces. I do remember your mum from the old Laindon Library days when I lived nearby in Denbigh Road.